2 metre IEC C20 to IEC C19 jumper cord cable on 1.5mm cores Black. IEC Server Power Lead. 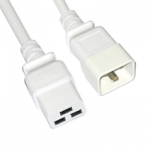 Order Code / SKU: 2C20-C19 Category: IEC C20 to IEC C19 Jumper Leads. Tags: IEC C19, IEC C20, jumper cord. This is an IEC C20 Male to IEC C19 Female extension lead on 2 metre 1.5mm² 3 core black mains cable on harmonized mains cable with Brown (Live), Neutral (Blue) and Green/Yellow (Earth). 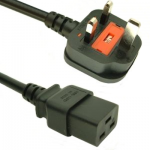 The IEC C20 to IEC C19 mains power cord is also commonly known as server power lead and also IEC Jumper lead. 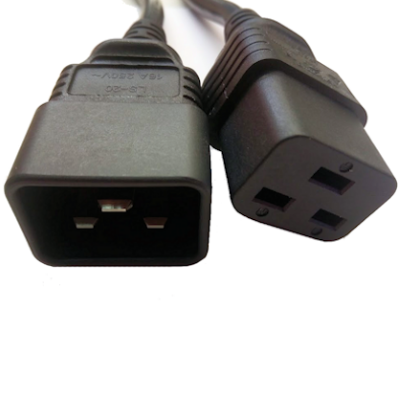 IEC C20 and IEC C19 cables are mainly used in standard and higher temperature servers as both the IEC C20 and IEC C19 connectors are rated at 16amps with a 70°C operating temperature. 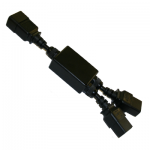 If you need an even higher rated temperature then you’ll need the IEC C21 Connector which has a maximum rating of 155°C.